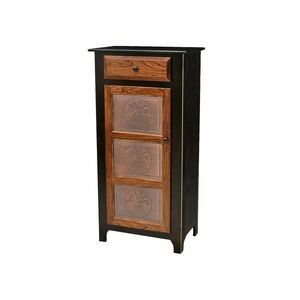 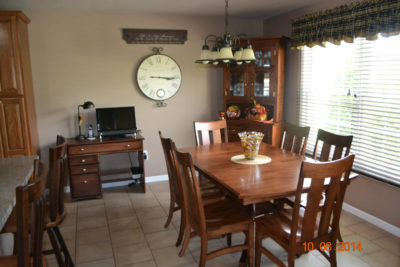 We recently add a Pie Safe to our Hickory Dinning Room Set. 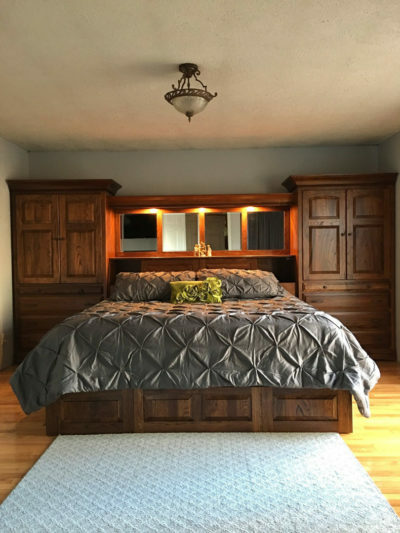 Our King Bookcase Unit Bed is custom made with even more storage to fit this wall perfectly! New home office, with new roll top. Absolutely the nicest piece of furniture, only to be outdone by Steve and Junior! Bravo! 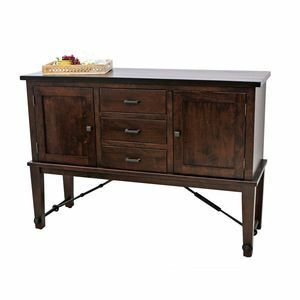 Our Manhattan Desk gets a beautiful new look with the Flame Birch top and drawer fronts. The rest of the desk is Brown Maple wood with Ebony stain. 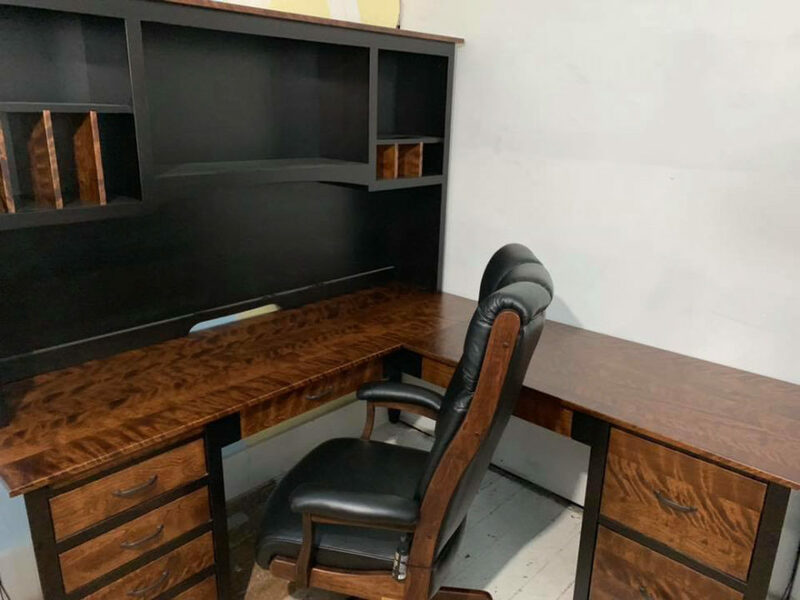 It is paired here with the CE58 Desk Chair in black leather. Our H3P1D Pie Safe and matching recipe box get a fresh, new look with the Glacier White paint and star tins. 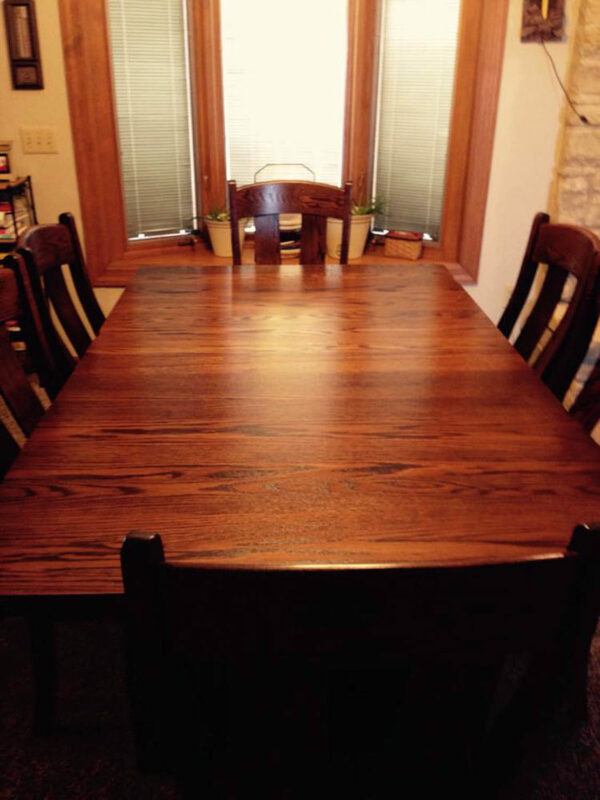 The roughsawn, Quartersawn White Oak top and fronts have Asbury Brown stain. We so enjoy our custom pie safe and coordinating recipe box! A towering, custom entertainment center creates a stunning focal point in this great room. 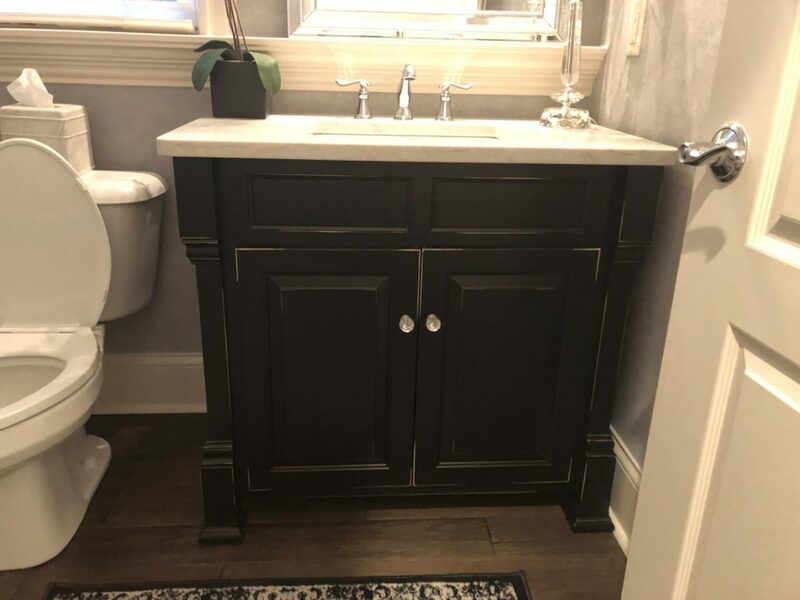 A custom bathroom vanity allows you to match your master bedroom style and create the space you need! 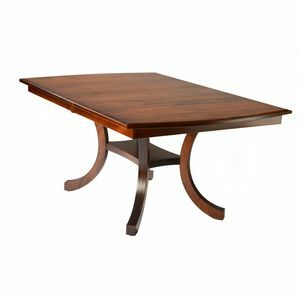 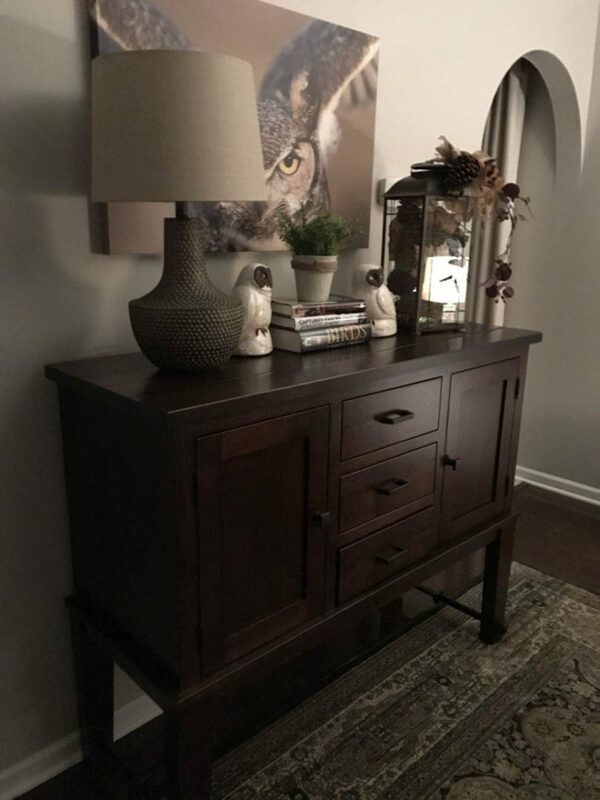 We built a beautiful, custom sofa table with the Hillside Pedestal style in Cherry wood with Asbury Brown stain. 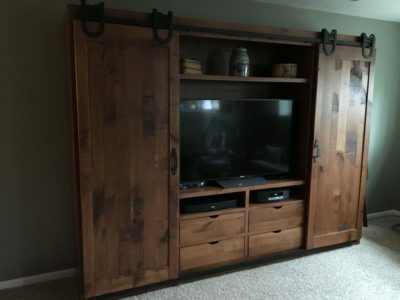 Another beautiful piece from Dutch Craft Furniture. We had this custom sofa table made for our Arizona house. 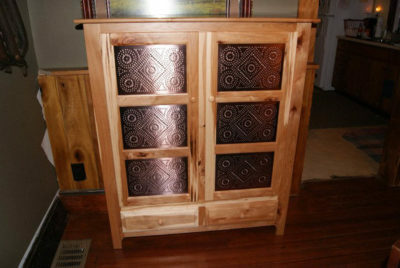 It’s always a wonderful surprise when you customize a piece of furniture. 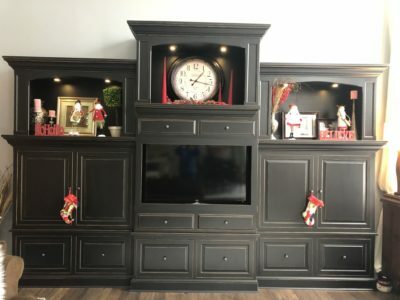 We are never disappointed! 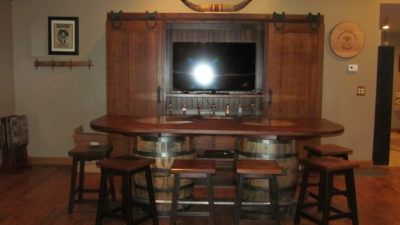 Thanks Reuben and Gary, you are the best! The Western Dining Set is a perfect complement in this beautiful dining area! A custom, upholstered king bed sets the tone in this beautiful master suite. 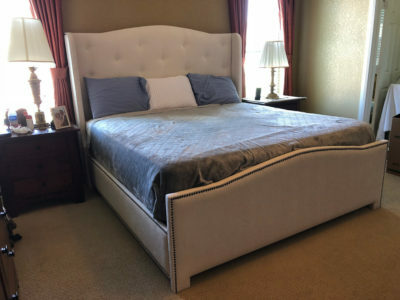 Note: Fabric#B-7507 Off White with black pearl nailheads. 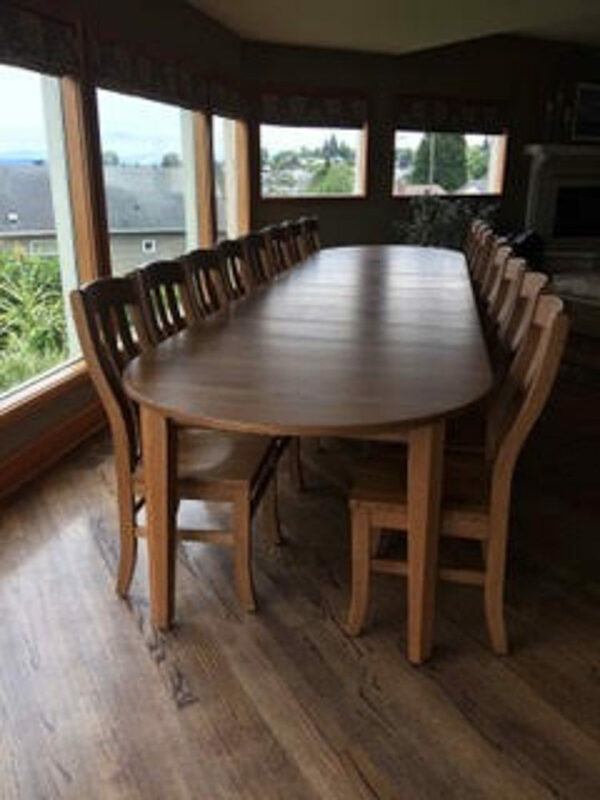 Here we built a 44x72 Shaker Leg Table with an oval top and 8 leaves, extending the table to 14' long! The set is shown with the Fostoria Chairs in Rustic Quartersawn White Oak wood and Sealy stain. 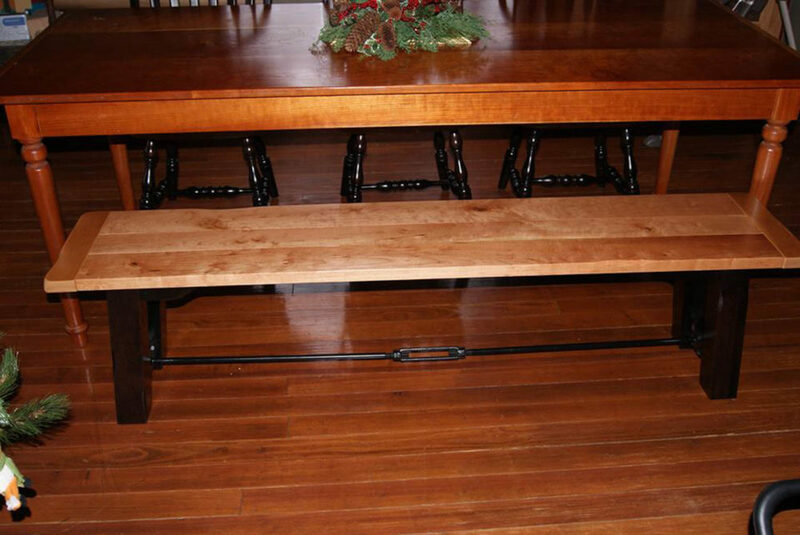 Note: These leaves will not all self store & we added 2 center legs for additional support. 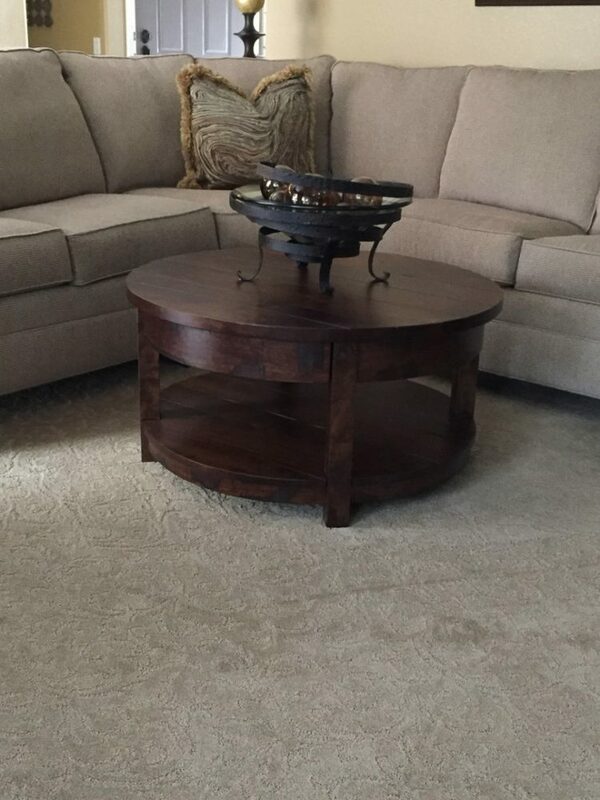 We created a beautiful, 36" round coffee table in our Arcadia style with the lightly distressed plank top in Character Cherry wood and Asbury Brown stain. Coffee table in Arizona Home. 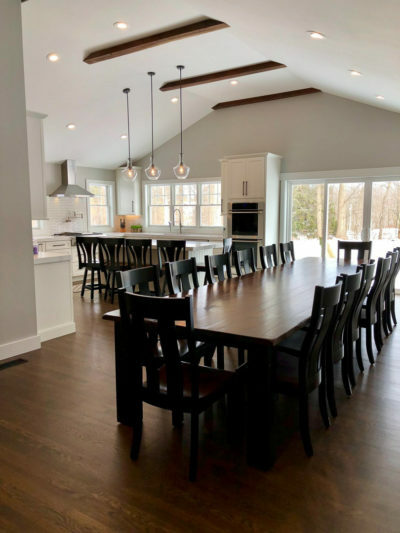 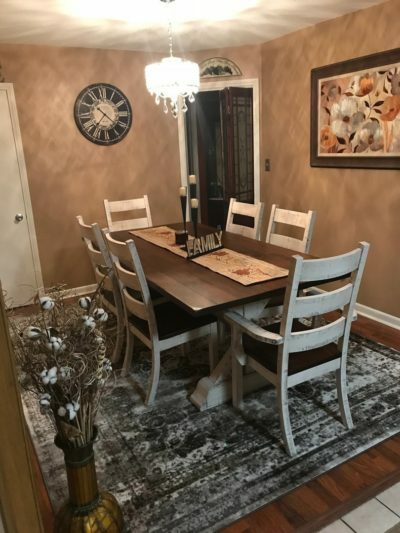 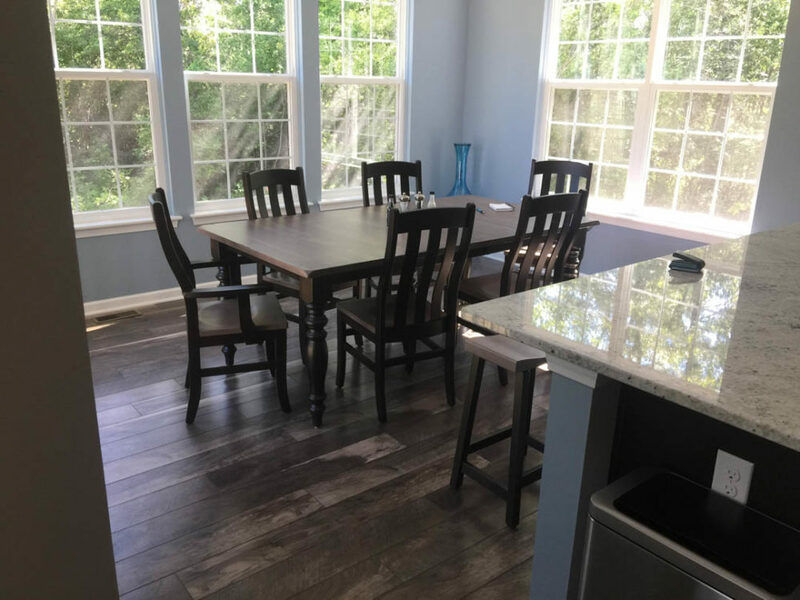 For this dining room we built a 4' x 14' solid plank style table with Square Legs and 16 Urbana Chairs in 2 tone with the base in Maple wood with Ebony stain and the top in Rustic Quartersawn White Oak wood with Golden Brown stain. 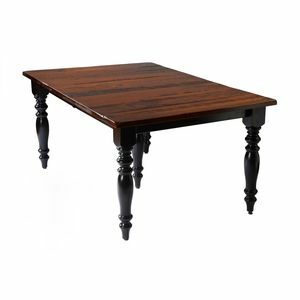 *Note-We used a 5" square leg due to the size of this table. 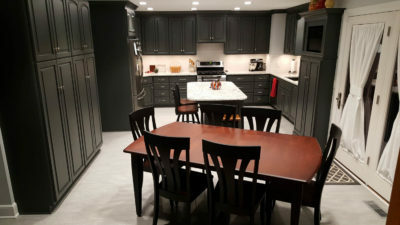 This island features our 24" Hudson bar chairs with swivel bases in 2 tone, Maple wood frames with Ebony stain and the seats are Rustic Quartersawn White Oak wood with Golden Brown stain. 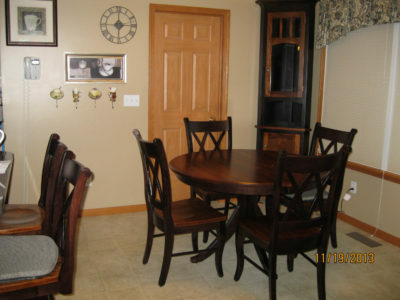 We are so happy with our new furniture...look how great everything looks in our home. Thank you for quality furniture and superb customer service. 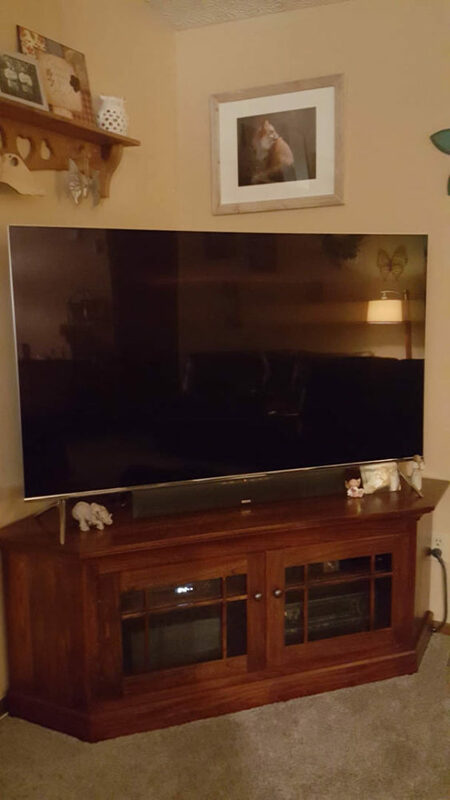 We'll be back for more! Our personalized barrel table is shown here with a Maple top and Boston stain. 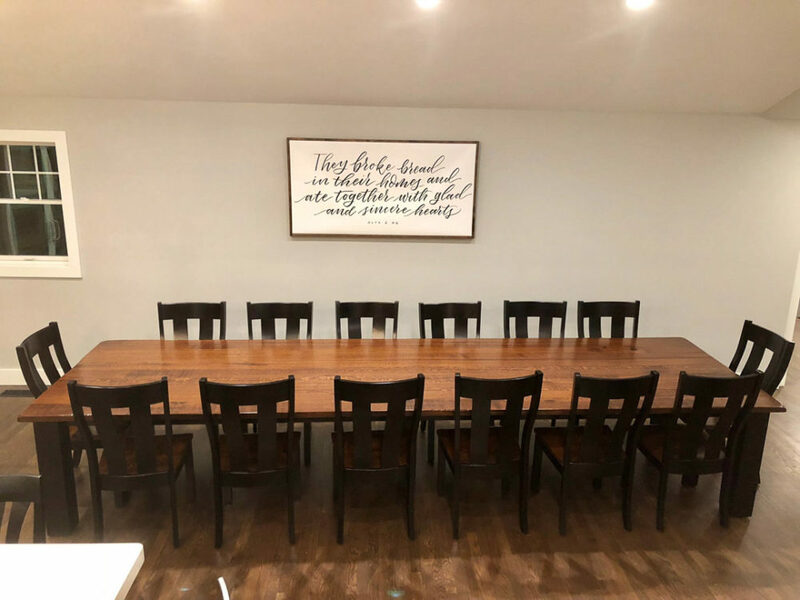 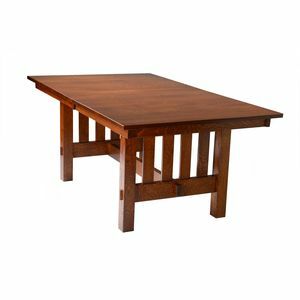 This dining room features a 44x66 Settler's plank table with turned legs and 4 self storing leaves, opening the table to 44x114. It is paired with the Fostoria Chairs, all in 2 tone Maple wood, with Onyx and Boston stain. 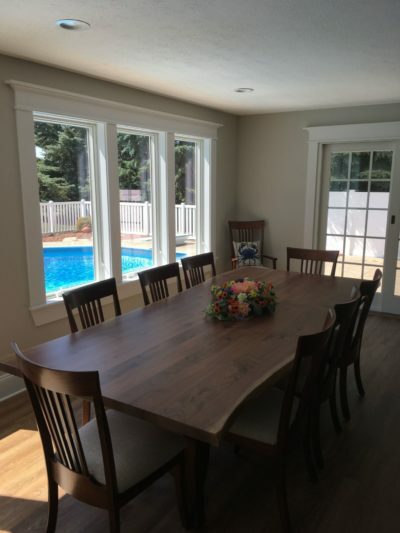 This dining room features a custom 7" turned leg style for a 44x66 table with a 2.5" thick Settler's plank top. It is paired with custom Deluxe Ladderback Side Chairs. 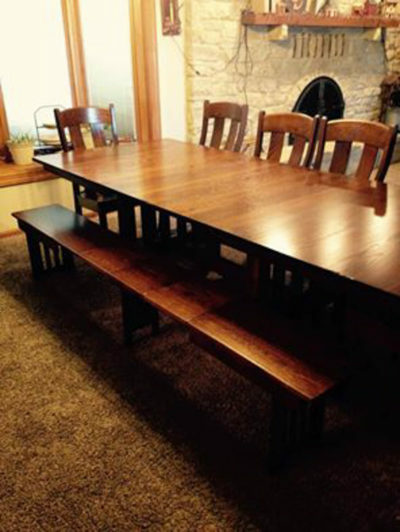 We built this set In heavily distressed Rustic Quartersawn White Oak wood with Golden Brown stain and a black glaze. 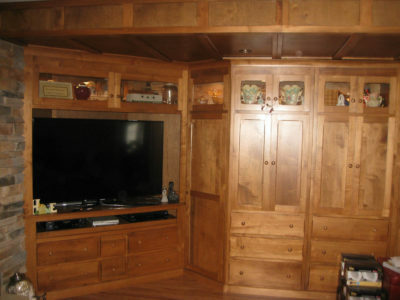 Beautiful Elm wood with Michael's Cherry stain highlights a classic style corner TV Stand. 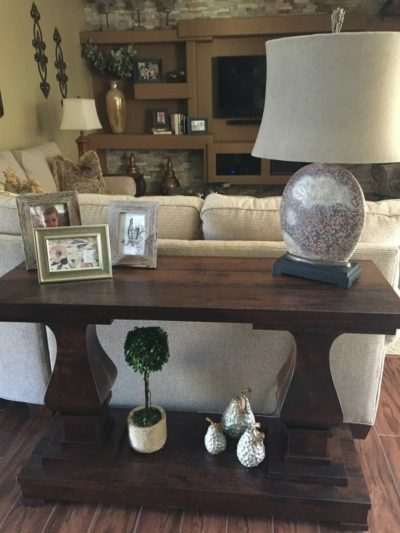 A stunning Live Edge Slab always makes a statement! Here we built a 48x108 Walnut slab with a Shaker Hill Trestle base in Maple with Asbury stain. The chairs are OW Shaker 5 Slat style with fabric seats. A local vacation cottage features a King Aubrey style bed with the standard footboard in Brown Maple wood with Onyx stain. See it in person at Red Cottage Hideaway! 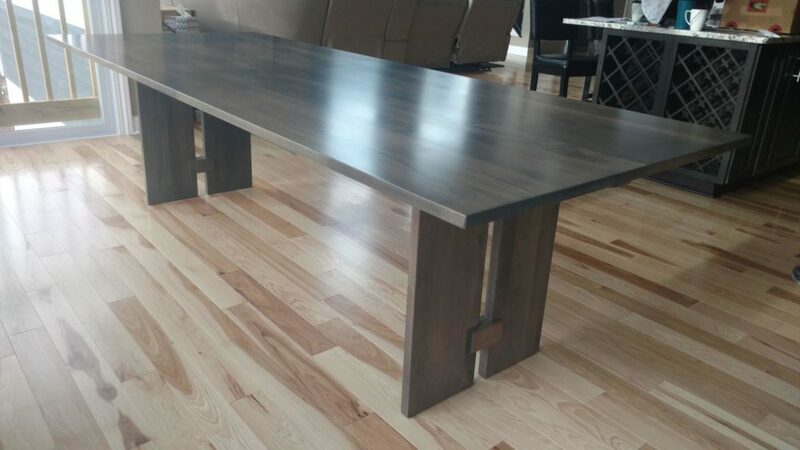 Here we built a stunning custom table, 42x108, with a 1" thick solid top and 1/8th round over edge in Brown Maple wood with Antique Slate stain. 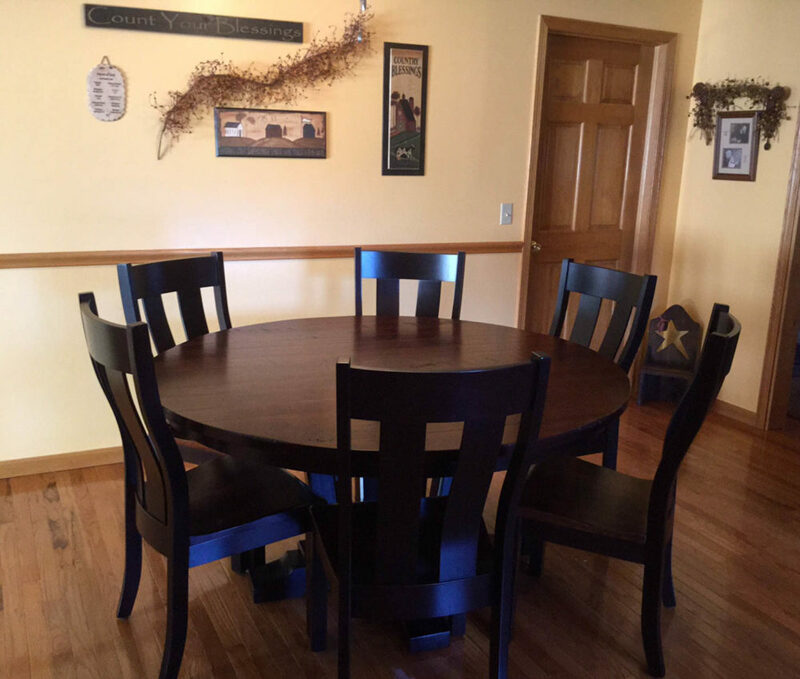 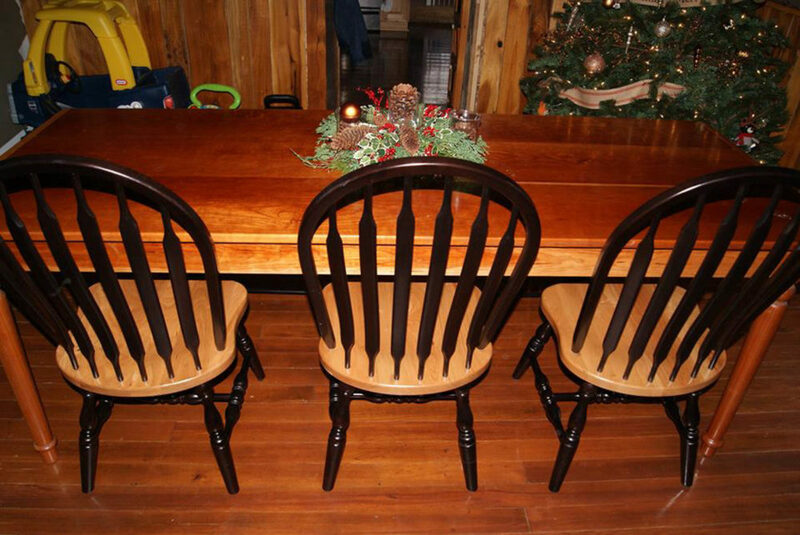 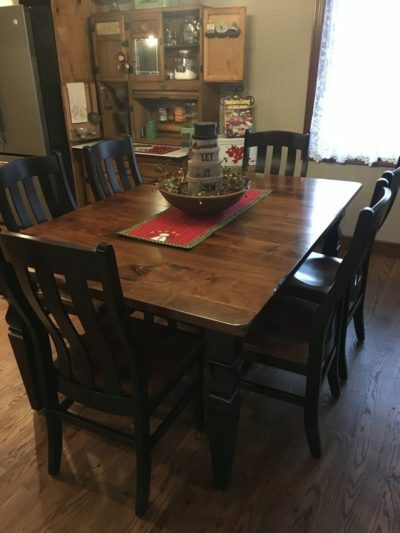 This set was a standard Settler's Farm Leg Table and Fostoria Chair style that got a custom stain mix.The color is a mix of 1/2 Coffee and 1/2 Onyx on the chair frames and table legs with Driftbury stain on the table top and chair seats. 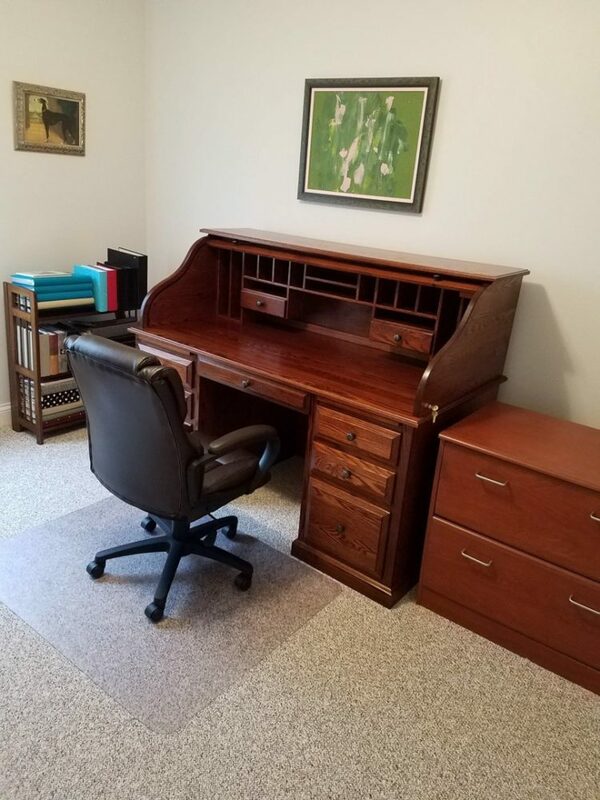 It has a Low Sheen finish. 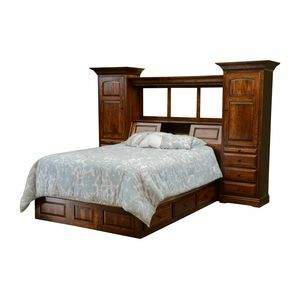 This is a full sized version of the Carrington Bed with deep drawer units. 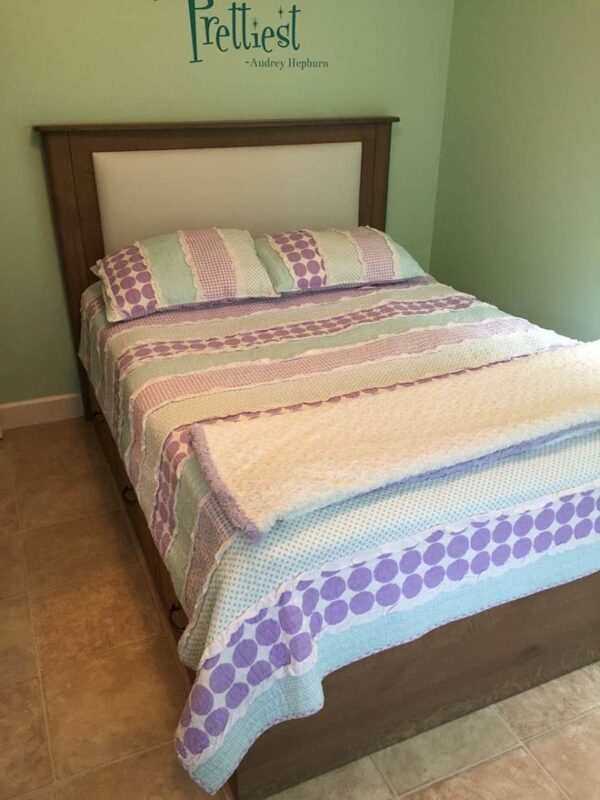 We lowered the headboard height to 48" and added a faux leather panel in the headboard for a little girl's room. It is built from Rustic Quartersawn White Oak with Driftwood stain. Our Barn Door Entertainment Center becomes a beautiful focal point in the livingroom! 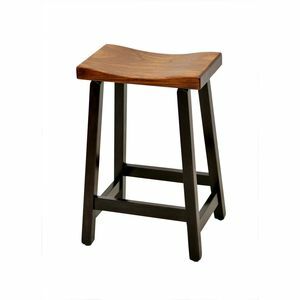 It is built with Rustic Quartersawn White Oak wood and Golden Brown stain. 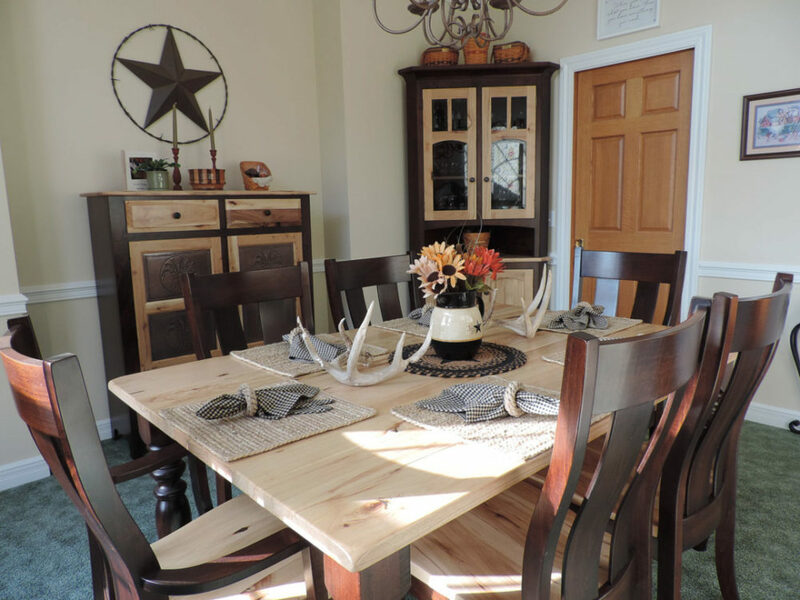 The Settler's Trestle Buffet looks wonderful in this cozy setting! It is displayed in Brown Maple wood with Rich Tobacco stain. Here is a one version of the Classic Shaker Leg Table, paired with a customized chair style. 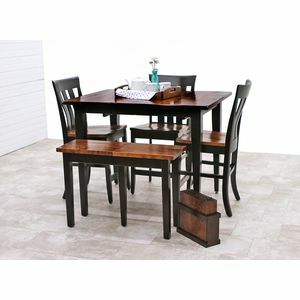 The set is shown in Brown Maple wood with Rich Tobacco stain. 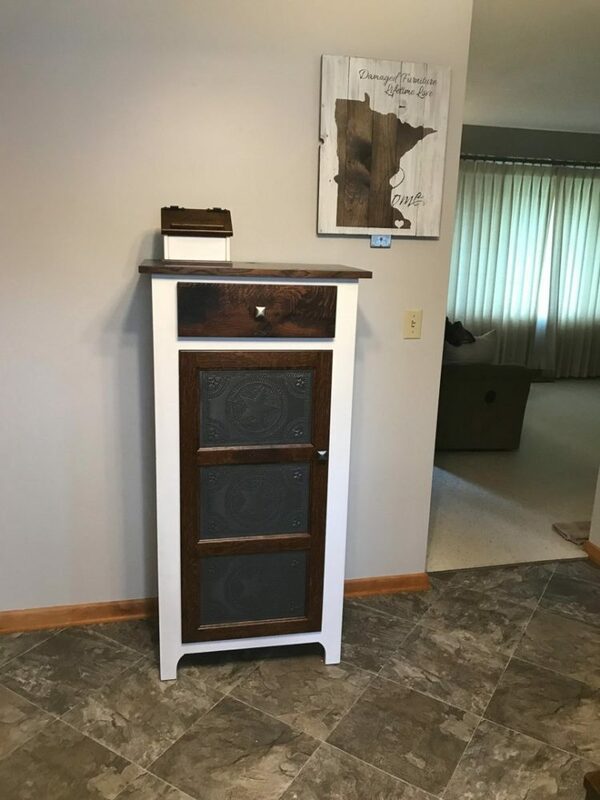 Here we have a #H6P2D Pie Safe, with custom tins and the drawers at the bottom, built in Rustic Hickory wood with a Natural finish. Create your own bar area with the Whiskey Double Barrel Table and #9 Mission Stools, with the Barn Door Entertainment Center playing the big game in style! 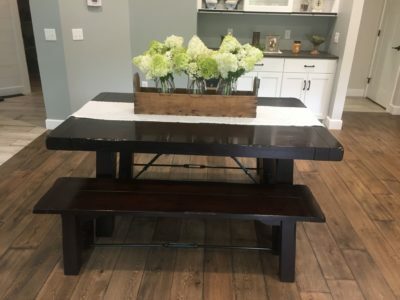 The table features a custom shaped top for serving drinks from the back, and the entertainment center gets an upgrade with shiplap planks behind the TV. 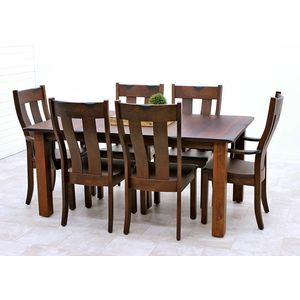 The set is built in Rustic Quartersawn White Oak and Golden Brown stain. 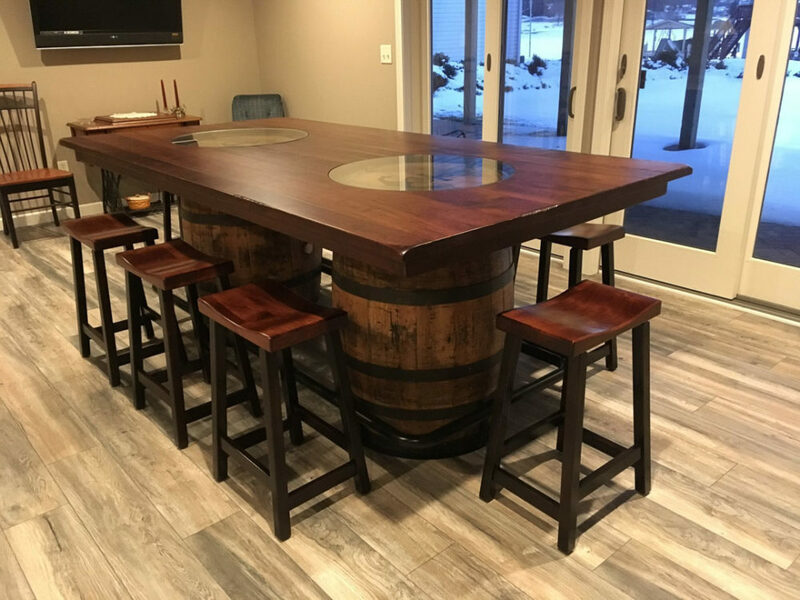 Here is the Camden Shaker Pub Set with the stationary Lincoln Bar Chairs and the 3'-6' Extend A Bench, shown in 2 tone with Brown Maple wood and Onyx stain, while the table top and chair seats are Elm wood with Michael's Cherry stain. This is a standard Heavy Mission Trestle Table, Austin Chairs, and a Mission Extend-A-Bench shown in Oak wood with Asbury Brown stain. 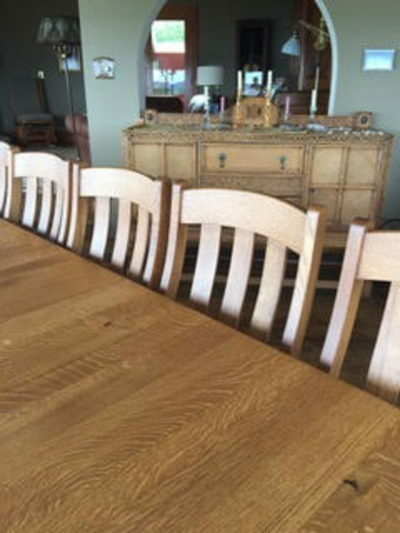 A beautiful Oak wood table is paired with Austin Chairs in the Asbury Brown stain color! 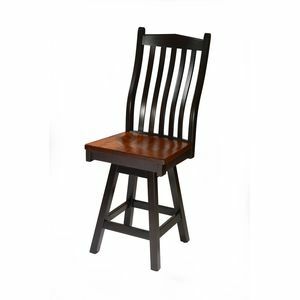 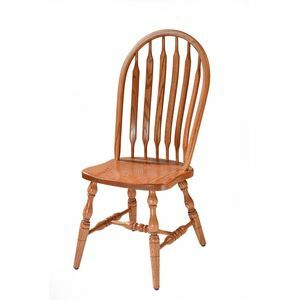 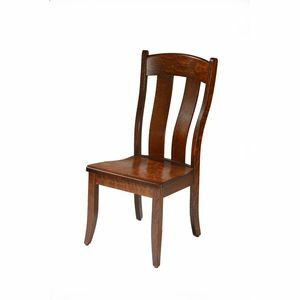 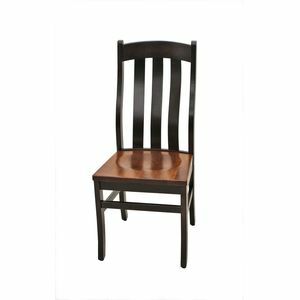 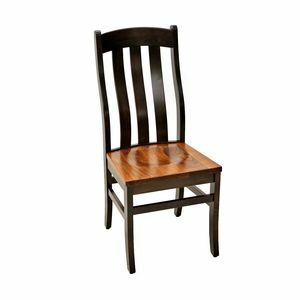 The classic High Bent Paddle Chairs get a new look built in Brown Maple wood and Ebony stain, while the seats are made of Rustic Cherry with a Natural Finish. 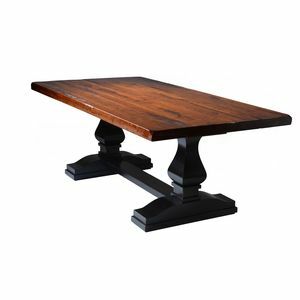 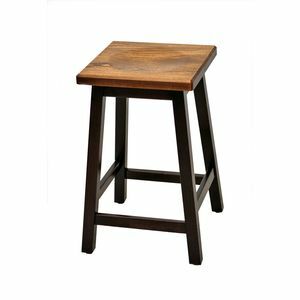 Here is a Settler's Trestle Bench, shown with a Brown Maple base and Ebony stain, while the seat is Rustic Cherry wood and Natural finish. 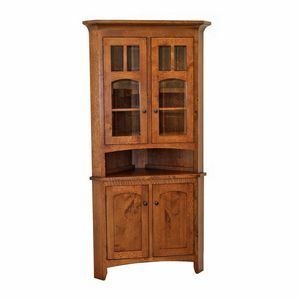 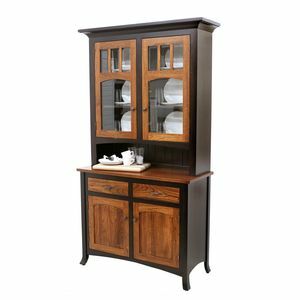 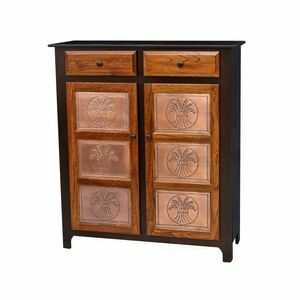 This set pairs the Carlisle Double Pedestal Table with custom dining chairs, Post Mission Bar Chairs with flush top boards along the counter, a 2 Door Biltmore Hutch in beveled style, and a small custom writing desk for a complete kitchen outfit! 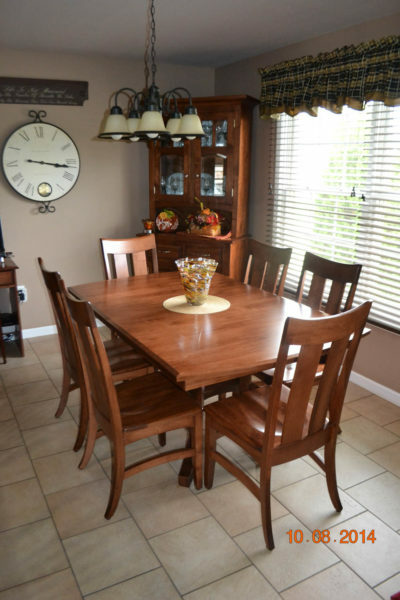 This set is shown in Brown Maple wood and Boston stain. Here is another look at the beautiful Brown Maple set featuring the Carlisle Double Pedestal Table, custom chairs, and 2 Door Biltmore Hutch, beveled style, all with Boston stain. 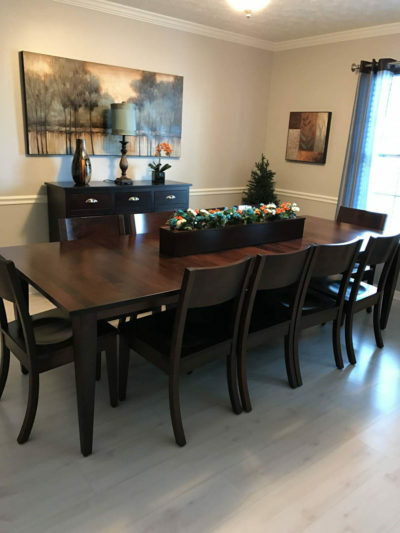 The round Splay Pedestal Table, Double X Chairs & Swivel Bar Chairs are shown here in 2 tone with Brown Maple wood and Ebony stain, complemented with Elm top and seats with Michael's Cherry stain. 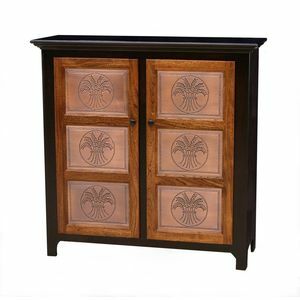 The set also features custom chair pads for the bar chairs and a Biltmore Corner Hutch, scaled down to a single door size to fit the area. 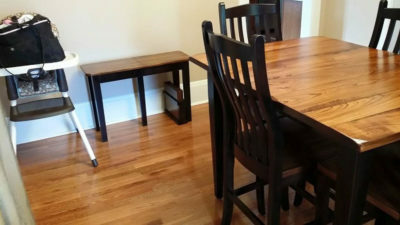 This set features the Classic Shaker Leg Table with a sabre shape top, 1" radius corners & chairrail edge, Hudson Side Chairs, and Post Mission 2 Slat Bar Chairs, all built from Brown Maple wood, painted Black, with the Character Cherry table top & chair seats in Ace Cherry stain, all in Low Sheen finish. 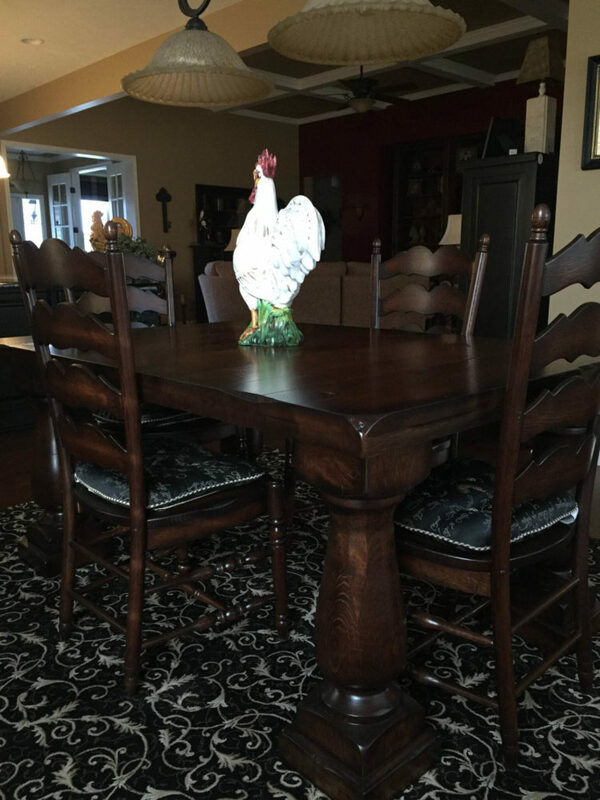 Here we have a large round Albany Pedestal Table, paired with the Urbana Chair, shown in Character Cherry wood with New Burnt Umber stain. 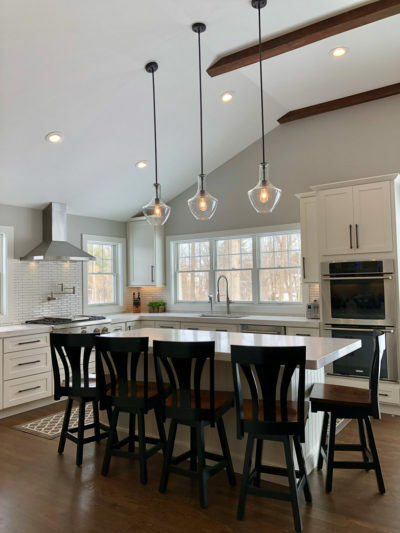 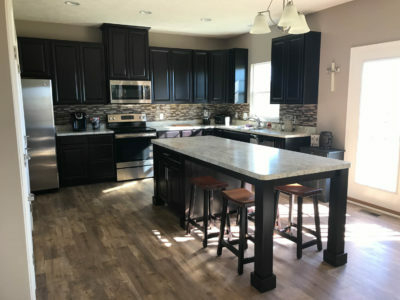 A large Custom Island and Urban Stools, built to match the kitchen, is shown here in Brown Maple wood with Ebony stain and Character Cherry seats with Michael's Cherry stain. Here we have custom wall to wall built in storage cabinets and entertainment center, shown in Brown Maple wood with Baywood/S-14 stain. 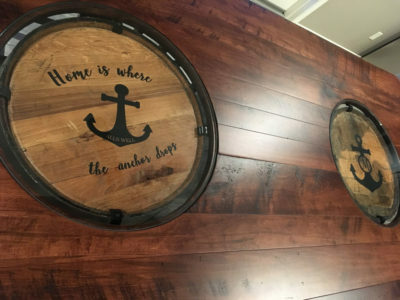 Your Name Upload your photo Tell us about your project!